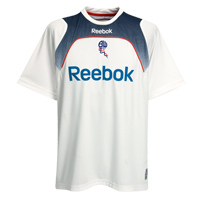 Official 08-09 Bolton football shirt, to be worn in the 2008/9 Premiership. Manufactured by Reebok. Official 07-08 Bolton Away football shirt, to be worn in the 2006/7 Premiership. Manufactured by Reebok. Official 06-08 Bolon Away football shorts, to be worn in the 2006/7 Premiership. Manufactured by Reebok.